Amecco (or Amusement Equipment Company Limited) have been involved with the running of the pier for over 60 years, from 1938 as sub-lessees from the South Wales Transport Company, then as owners from 1971. The records of the South Wales Transport Company Limited include documents concerning the history of the pier, from the original plans approved by the Board of Trade, to its sale to Amecco. 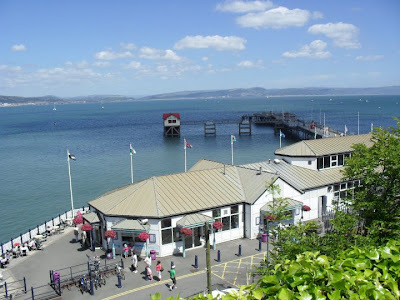 In 1889, an Act of Parliament was obtained incorporating the Mumbles Railway and Pier Company, who built an extension of Mumbles Railway to Mumbles Head, and a new deep water pier. The new line and pier opened on 10 May 1898. In 1899 both Mumbles Railway and the Pier were leased to Swansea Improvements and Tramways Company. This lease was later transferred to the South Wales Transport Company, who sub-leased the pier to Amecco. In 1959 the South Wales Transport Company purchased the pier, hotel and railway from the original owners Swansea and Mumbles Railways Limited and Mumbles Railway and Pier Company. While the railway was soon after abandoned, South Wales Transport allowed Amecco to continue their lease of the pier, before they eventually purchased it. The collection shows that today is not the only time that the Pier has been in need of repair. In 1952 it was closed and declared unsafe. Files kept by the company’s secretary include reports on the negotiations between the lessees and sub-lessees for the repair and plans of the proposed new jetty. There is also a folder of plans and correspondence with the Royal National Lifeboat Institution concerning a new lifeboat station and an extension to the slipway in the 1920s, and the establishment of an inshore lifeboat station in the 1960s. There are a large number of deeds from the Swansea Improvements and Tramways Company in the collection, including some agreements for facilities and amusements for the pier in the 1900s. These include agreements with a Pierriot troop (they would appear every day except Sundays), a company supplying a Mutoscope Machine (an early motion picture device), a company supplying a confectionary machine, the lessees of a photographer's shop and a fancy dealer's shop. One of the attractions at the Pier was the Pier Hotel, which included a dance hall. Papers concerning a dispute over the lease of the hotel in the 1940s show how the hotel was enjoyed by people during the Second World War. Officials of the South Wales Transport Company described how goodwill and increased business was brought about by the war, with more troops in the area, a greater safety from bombing in Mumbles over Swansea and travelling restrictions meaning that more people are taking local holidays. Drafts of proofs of evidence from inspectors on the railway explain that during the war dances were held every night except Sunday, with one of the inspectors stating that people seem to have ‘gone crazy on dancing, drinking and any form of amusement during the war’. The visitors to the war time dances were mainly American troops, a large number of merchant seamen of all nationalities, some British troops and munitions workers. These papers also show the inherent link between the railway and the pier, with one inspector estimating that 90% of people attending the dances would travel there and back on the railway. The trains ran every 16 minutes, and sometimes the driver was unable to stop until Oystermouth because the carriages were so full. With this in mind, it would be interesting to see if there has been, or will be, any talk of proposals to bring back the Mumbles Railway, to complement the planned rejuvenation of the pier.